Stories and perspectives for those who love living with crafts and fine art! 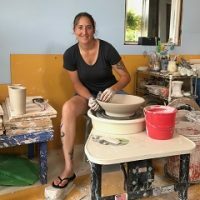 Open studios have increasingly become an available and entertaining way for fine arts and craft aficionados to find and collect work from their favorite artists. Patrons can visit artists in their studios, see how they work and select from the broadest collection of their works. Here are upcoming open studios dates for some of our exhibitors. 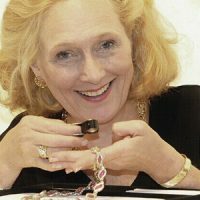 Choosing a ring for a loved one can be a nerve-wracking experience, and the endless variety of choices can make it even more of an endurance test. How to pick from the hundreds and hundreds of rings on display at your local jewelers? But there’s another option to the mass market ring, which is to have a jeweler design a custom ring just for your loved one. Custom rings give you the opportunity to create a dream ring, one that will have greater meaning and importance to the wearer for a lifetime. 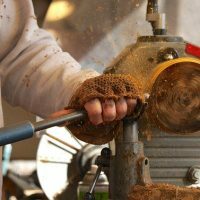 For accomplished woodturner Eric Reeves, turning exotic woods into magnificent bowls, vases, platters and other objects is only one of his heart-felt passions. The other is helping those less fortunate. His pleasure in creating and selling his art is complemented by the pleasure he takes in sharing 100% of the proceeds from all sales with humanitarian relief organizations working in greater Sudan. When we think about “fiber” what usually comes to mind is the essential ingredient of those useful items tucked away in our closets and drawers – shirts and pants, sheets and towels. But in the fiber art world, there’s a different attitude towards the utilitarian materials we wear on our backs or use on our beds. 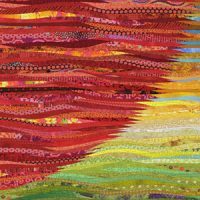 Fiber artists magically transform bits of fabric, skeins of wool, sewing thread, and silk embroidery floss into imaginative works of art that command our attention. Mixed media presents all sorts of opportunities for artists to express their ideas by incorporating a wide range of materials into their artwork. 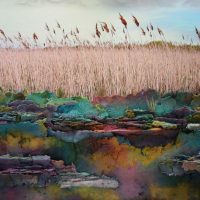 Typically, we think of mixed media as a technique that combines art materials, such as mixing acrylic paint with oil pastels, enhancing photographs with colored pencils, or creating collages from all sorts of paper. Many artists have expanded beyond the traditional artistic medium to incorporate found and recycled objects or natural materials like eggshells, feathers, bark, and even soil to create unusual effects and textures in a piece.